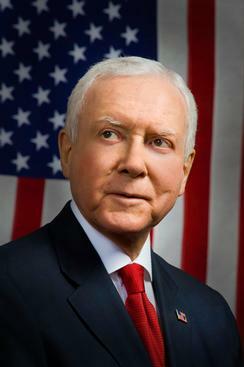 Senator Orrin Hatch has a sharp eye. In response to my July 10th testimony to the Senate Committee on Finance hearing on “Helping Young People Achieve the American Dream” I received some homework, a series of questions asking me for a good deal more detail. Senator Hatch, who is a US Senator for Utah, asks a thoughtful question about measurement issues. I will offer my answers to all the questions in a series of blog posts over the coming days. You can review the questions at my November 11th post. But I would like to begin with the first question Senator Hatch asks because it gives us the opportunity to clarify what the statistics mean. This is a good place to start. The Senator asks the following. In looking at data used to capture opportunities for upward mobility for Americans over time and mobility comparisons across countries, I wonder how you control for the many changes in the economic environment over time and differences in measures across countries. Surely, parents of children born in the 1960s or 1970s or 1980s faced far different economic policies, labor market dynamics, immigration dynamics, and global trade in labor and capital than those faced by their children. In the U.S., for example, it is difficult to deny that labor market experiences of females have changed markedly since the Second World War. Rewards to skill seem to have been changing due to technological changes. Entry of China and India into global trade has surely altered labor market dynamics and outcomes around the globe. And there is evidence that there has been growth in associative mating, with people marrying others who share similar occupations. When looking at intergenerational mobility, we look at comparisons between outcomes of parents and children. Yet the environments facing parents were often far different from those facing their children. In looking at income measures in the U.S. over time, some studies, including ones by Pew, measure income exclusive of non-wage benefits and certain government benefits like food stamps. Yet, over time, Americans have increasingly taken compensation growth in the form of non-wage benefits. Excluding them seems, to me, to exclude a lot of what has been happening in labor markets over the past few decades. How can we extrapolate from historical evidence on parents versus children when people are raised in far different economic environments and possibly receive income in far different forms over time, to craft federal mobility policies for today and the near future? It is very important to appreciate that there are several different ways in which we can discuss and analyze the extent of mobility across the generations. The Senator’s question raises the importance of being clear as to just what we are talking about: not just measuring outcomes in a consistent way but also, and more importantly, recognizing that the economy and society have changed in fundamental ways across the span of a generation. My sense is that the academic literature is based upon data that permits a comparison of apples to apples: it is based upon data sets that seek to maintain a consistency in the measurement of earnings over time. Though obviously some data do this better than others. The focus is usually on earnings and wage rates as determined through an employer-employee relationship. In this case it is appropriate to exclude government benefits. Other studies do focus on the intergenerational transmission of total income, and also on the transmission of government benefits. I wonder how you control for the many changes in the economic environment over time and differences in measures across countries. This an important concern, and addressing it helps us to appreciate just what we are talking about when the research is interpreted as saying that mobility is lower in the US than elsewhere. Part of this also involves the changing forms of compensation, and any non-wage benefits that form part of the compensation package. Some of the changes alluded to in the question are factors that influence the degree of mobility, the rewards to skill is an important example, and assortative mating is another. As such they are the very subject of studies that examine the experiences of different cohorts of individuals, a topic addressed in some of the other questions. It is important to draw a distinction between “absolute” mobility, and “relative” mobility. The claim that the US is less mobile than many other countries is a claim about “relative” mobility. It is legitimately measured, in spite of all the economic changes that have occurred over the course of a generation, because it refers to the extent to which a father’s income is above or below the average income of his generation, and the extent to which a son’s income is above or below the average of his cohort during his adulthood. All of these important changes are controlled for in the sense that we are talking about the deviations of each generation from their own average. The averages of each generation are different and reflect all of the changes in economy and society to which the question alludes.These changes are captured in the averages, with the deviation from the average being the concern of indicators of relative mobility. Generally, with increased productivity and economic growth we would expect children to on average earn more than their parents did a generation ago. The question the literature has focused upon is: to what extent do we expect a child to be above the prevailing average if his or her father was above the average that prevailed a generation earlier? In the United States only 50% of a father’s gap (above or below) the average income is closed in the son’s generation; in Canada and many other countries 80% of this advantage or disadvantage disappears. This is the predominant way of examining the degree of generational mobility in the academic literature in part because of the concerns the Senator raises in this question. But alternative measures are also interesting: are children—as a whole—making on average more or less than their parents? This refers to absolute mobility. An additional question of interest is whether children have a tendency to exceed or fall short of their parents’ place in the income distribution? There is less cross-country comparative evidence on these indicators, but I think it might be fair to say that the observation that the average standard of living has risen over time is a weaker assessment of mobility than the “relative” degree of mobility. Focusing on absolute mobility would also imply that individuals evaluate their well-being with reference to the experiences of a generation ago, rather than to the experience of their contemporaries. 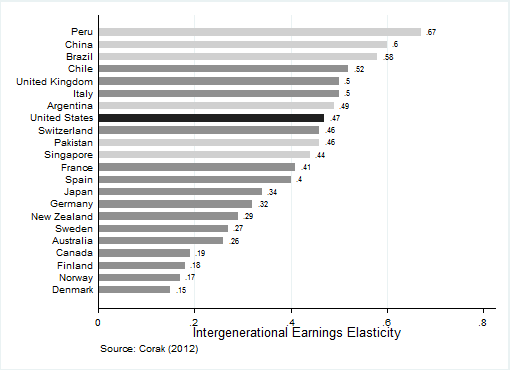 There are, after all, very long lags embodied in the research on intergenerational mobility. Most studies refer to a cohort of people who were born roughly in the early 1960s, went to the schools of the 1960s and 1970s, the colleges of the 1970s and 1980s, and began their careers by getting jobs in the labor markets of the 1990s. Is it reasonable to use this experience to guide public policy addressing the needs of the next generation of children? Yes, it is, but only to the degree that we understand the underlying drivers of the mobility process. If we appreciate how labor markets have changed, how families have changed, and how public policy has changed then we can make reasonable suggestions on the challenges that more recent generations of children face, and the possibilities for public policy. It is the interaction of these three social institutions—labor markets, families, and public policy—that drive the process. Labor markets are now more unequal than they were a generation ago, families are more diverse and time-stressed, and public policy is less progressive. All of these drivers suggest in the very least that mobility will not increase. We can also see this by looking at child outcomes at earlier stages in the development of our children: health in the early years, school readiness, literacy and math test scores in the middle years, high school drop out rates, and university completion rates are all indicators that can be used in the here and now to make reasonable suggestions on future developments, and policy options. So the answer to the question is that to extrapolate from the experiences of the past we need to be aware of the nature of the changes that have occurred over time, and to examine how they are related to the underlying drivers of mobility. My understanding is that research has shown that simply attending pre-school is an excellent predictor of some relative success later in life. Pre-school is a relatively recent invention, so presumably you need to control for access to it. If inter-generational mobility (especially positive mobility) is strongly correlated with access to pre-school, that would be a good argument for universal access to pre-school, right? There has certainly been a good deal of work on the importance of the early years in determining life chances. But also that these early investments need to be supported throughout the series of transitions that children make as they progress through the schooling system. Janet Currie, for example, has written on these issues. I am not so certain that this necessarily equates with universal access. There may be a trade-off here between the availability of resources and targeting on those who would benefit the most. Just a couple of comments more in response to Darrell Durett’s observation and your reply rather than the blog article. 1)	Universal versus Targeted – Targeted programs aim at prevalence of behaviour/learning challenges or ‘under-development’, but prevalence is about probability and relativity. In absolute terms, the greatest numbers of those ‘at risk’ of underachievement and even dropping out are in fact in the lower middle and middle class. Targeted programs focus on closing the gap between lower and middle, but miss the gradient. Fraser Mustard and Margaret McCain were quite strong on this point when promoting early child development. 2)	Amplification: Perhaps contradicting my first argument and from a viewpoint with no strong evidence to support, I have the instinctive feeling that children coming from a intellectually stimulating and supportive home derive greater ‘return on investment’ from pre-school and other enabling programs than their less fortunate peers. In other words, pre-school initiatives might ‘amplify’ the gains of already advantaged children. I have read a few articles related to building resilience that suggest this might be the case. 3)	What gap? : Ignoring the evidence regarding the non-effectiveness of the U.S. Head Start program, in excellent and positive evaluation studies of high quality programs such as Perry Pre-School the comparison is between relatively equivalent social or economic peers. While Perry Pre-School through controlled studies can demonstrate program attendees perform better academically, less likely to commit crimes and end up in jail, and less likely experience problems with substance abuse etc, they are not being compared to children from middle or upper class. There is no solid evidence these programs actually close the gap or lower the gradient slope – the best we can say is they prevent them from sliding backwards (relatively speaking) into the ‘under-class’. 4)	Static Policy Ideas in a Dynamic World: The benchmarks of ‘achievement’ are dynamic not static. What is expected of a child entering Kindergarten in 2012 in terms of “ready to learn” cognition and skills is higher than that of a child in 1965. Just as one could enter a high reputation university and good program with a 70-75% in 1978, but would now require an 80-85% (minimum!) and the number of students achieving Honours Roll is probably 2X that of 1978. Anecdotally speaking, when my children ask me about my high school grades (not particularly strong) my reply is ‘irrelevant, the game has changed and the goal posts adjusted’. Too often our policy ideas are static in method and outcome measurement using a backwards looking approach (in a rapidly dynamic world). Now perhaps more closely addressing the Senator’s comments and perspective, my other concern with the sometimes too strong focus on micro interventions such early child development (which I fully support) is that it detracts from the macro socio-political environment. In the post-war period, the macro effect of policies was to allow economic growth to ‘lift all boats’ and intolerance with income inequality (with more than a little help from the labour movement and unions to ensure this was the case). Certainly there was social inequality, economic uncertainty and poverty, yet the social outcomes of economics was more fairly distributed and less contingent on one’s skills if all you wanted was a decent living. Today, the macro policy environment is more inclined to competition and ‘winner-take-all’ approach hence the increasing importance of the micro (like early child development and intellectual development). We are told this is a necessity of national survival in a global world. Not sure I am buying that in full. Overall, I suspect our social policy has been ‘captured’ by economic ideas in which the focus is on the individual and family (blame) and too little on the macro political environment. And it leads to compensatory programs like early child development and perhaps too little asset building initiatives elevating families and their aspirations such that a stronger learning environment and support is framed in a ‘natural’ unit. Less a case of discard early child development and more an argument for a better policy balance between professional learning environment and home environment. I, like so many of my boomer generation, came from lower middle class and working class families yet could indeed close the gap with the top. It was the macro that drove the pleasant findings of income mobility in Canada in the past and I personally experienced, and we need to rediscover that understanding. Shouldn’t higher mobility, with its implied higher downward component , lead to what Barbara Ehrenreich wrote about 20 years ago? Her book was titles “Fear of falling”. Do the more extensive social measures, notably access to health care and higher education, mitigate those fears anough to make them somehow disappear? I was reading in bed the other night when I told Angela, “There’s a beautiful graph in The Economist”. It turns out that it was yours! I don’t know if you remember our conversation at a Christmas party last year about blogging. I did get started and even wrote a couple of posts on income inequality. Please have a look. This is very impressive work that you are doing. Thank you for your kind words, and for pointing us to your blog at stephen.mccanny.ca . It looks like a nice mix of science and society! Yes, in fact the October 13th edition of The Economist ran a special report written by Zanny Minton Beddoes called “For Richer, for poorer” and at one point discusses the relationship between inequality and mobility across the generations, making use of the Great Gatsby Curve. The report is very nicely written, and is probably the first place readers should go to get an overview and synthesis of changes in inequality, the underlying causes, and a sensible discussion of the policy implications.